Acer first took the wraps off its Aspire V5 series at CeBIT in March, teasing the line of notebooks with designs that are 30 percent thinner than other laptops in their category. A few months later, in June, the company officially unveiled the 14- and 15-inch Aspire V5s, with Ivy Bridge processors and prices starting at $630. Rounding out that family is the 11-inch Aspire V5 171. We have a bit of an identity crisis on our hands with this guy: though it looks like a netbook and weighs a light three pounds, it packs a Core i5 Ivy Bridge processor befitting a full-fledged machine, but it costs a budget-minded $550 ($500 with Acer's current promotion). Many products in this price range are clunky 15-inchers, so where exactly does this Aspire V5 fit in? Join us past the break as we sort that out. The Acer Aspire V5 offers solid specs for a budget-priced 11-inch laptop, but that doesn't make it a must-buy. How would you rate the Aspire V5? With a weight of 3.05 pounds and a chassis that tapers from 1.09 to 0.82 inches thick, the Aspire V5 feels very light and manageable -- an impression that's reinforced by its compact 11-inch frame. There's something satisfying about gripping a laptop this size -- it's not like 13-inchers are even close to unwieldy, but this machine's petite shape makes it easy to tuck under your arm or stash in a messenger bag. The chassis' curved edges are comfortable, but the plastic underside and deck have a slippery feel, which doesn't exactly make for a solid grip. Though the V5 feels sturdy enough given its light weight, the screen is a bit wobbly. It doesn't take much nearby movement for the panel to dip backward. You can't expect a $550 laptop to blaze new trails in the style department, and unsurprisingly the Aspire V5's design is pretty conservative. The palm rest and keyboard deck sport a subdued slate gray finish, while the 1,366 x 768 display is framed by one very glossy bezel. We're not sure whether we appreciate the nod Acer made to a more upscale design feature with its faux-brushed metal lid -- it looks nice, yes, but once you touch it, it's pretty obvious it's made of plastic, not aluminum. 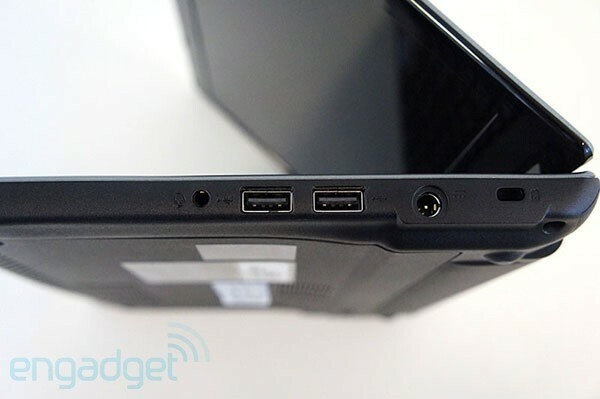 Along the left edge of the system, you'll find an Ethernet port, along with VGA, HDMI and USB 2.0 sockets. The right side is home to the mic jack, one USB 2.0 and one USB 3.0 port, the power connector and a security lock slot. The island-style spread on the V5 is one of the more comfortable keyboards we've tested lately. While the Aspire TimelineX 1830T sported a flat layout, the Aspire V5 has raised keys that are easy to find by feel. We didn't hit an all-time high when it came to words per minute, but we're able to type at a nice clip on this machine. Though the keyboard deck itself exhibits little to no flex, the keys themselves feel a bit jiggly in their sockets. It's not like we're afraid they'll fall out, but they lack the solid, forceful feedback of a more structurally sound setup. We're able to type at a nice clip on this machine. One downside to the keyboard is its size. This laptop's 11-inch design means there's not much space on the keyboard deck for cramming in all those keys. The arrow buttons bear the brunt of this limitation: they're quite shrunken, though other keys retain their standard proportions. Another ergonomic gripe: while width is a bit of an issue on this keyboard, so is height; the palm rest is short, which means your wrists are likely to dangle off the edge. 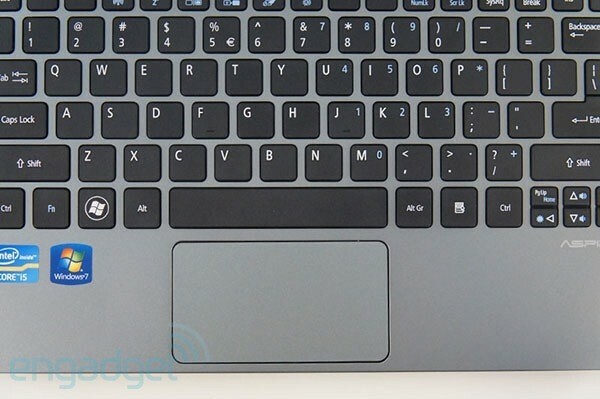 The Aspire V5's Synaptics trackpad isn't the smoothest. Paging through websites is a sluggish process, as the touchpad doesn't register long, fluid scrolls -- just shorter, more controlled ones. This means making your way down a webpage can feel like a stop-and-start ordeal. We had no trouble executing pinch-to-zoom, but there's a delay before the gesture is reflected onscreen. We've had to contend with some pretty erratic trackpads lately, so while the V5's has some shortcomings we at least have to applaud its consistency. No jumpiness, no errant or unregistered clicks. Both visuals and audio feel muted on the Aspire V5. When we fired up some HD trailers, colors lacked richness, and oftentimes we needed to ratchet up the brightness. The 1.3-megapixel webcam also delivers dark images, though it's sufficient for Skype and other video chat clients (we recommend steering clear of harsh overhead lighting). Viewing angles are pretty narrow as well -- the 11-inch display's 1,366 x 768 display is a glare magnet. The sweet spot for watching movies is definitely dead-center, as content washes out when you're even a bit to the right or left (or if you tilt the screen slightly back or forward). Even at max volume, music on the V5 sounds distant and faint. Dialogue in movies also sounds restrained, and audio comes through with a tinny, metallic quality. This machine isn't billed as an entertainment powerhouse and its mediocre multimedia features aren't exactly surprising, but we'd definitely recommend buying some external speakers. 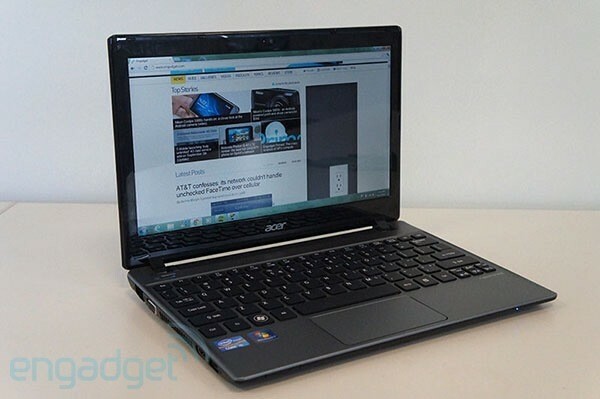 The Aspire V5 runs a 1.7GHz Core i5-3317U Ivy Bridge CPU with 500GB of storage and a generous 6GB of RAM. Those specs add up to some pretty, well, unremarkable, benchmark scores. In PCMark Vantage, it notched 6,152, which is significantly lower than numbers achieved by SSD-equipped systems. Of course, we don't see an 11-inch thin-and-light every day, so we're not comparing apples to apples when we see how the V5 stacks up to other laptops we've tested. The lack of solid-state storage separates it from Ultrabooks, but it still fares reasonably well. Its max read and write speeds -- 104 MB/s and 95 MB/s, respectively -- are quite modest compared to SSD-equipped machines, though they're about on par with the Toshiba Satellite U845's I/O performance. On 3DMark06, the Aspire V5 scored 5,351, which puts this system in line with other machines running Intel's integrated HD Graphics 4000. Many similarly specced systems scored lower, including the Lenovo IdeaPad U310. In real-world terms, you can expect good graphics performance for light gaming. In Batman: Arkham City, we saw about 50 frames per second. That drops considerably in Call of Duty 4, where the more detailed visuals bring things down to 20 fps. The Aspire V5 isn't the speediest, smoothest runner. But what about everyday performance? That's why you'd consider this machine, right? The Aspire V5 isn't the speediest, smoothest runner. It took 50 seconds to cold-boot, which is annoying, if not unacceptable. Working in two browsers, streaming music on Spotify and playing a few games taxes the machine: especially when we fired up games, we noticed the V5 getting a bit toasty. So, this laptop isn't for the power user, but that's not to say it's insufficient for more routine tasks like working in Microsoft Office, listening to music and doing whatever it is you do on the internet. On our video rundown test, which entails playing a looped video with WiFi on and brightness set to 65 percent, the Aspire V5's four-cell 2,500mAh battery lasted three hours and 31 minutes. 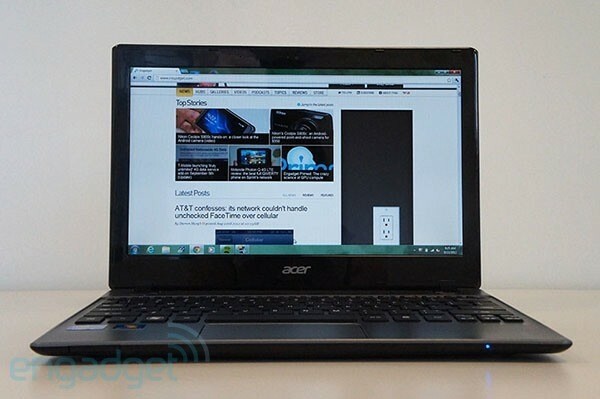 (Acer rates the machine for up to five hours of battery life.) In terms of everyday use, we've seen a similar runtime from this laptop. That time isn't very impressive -- it's bested by some of the shorter-lasting Ultrabooks like the Aspire S3 -- but it's not unheard of for a machine of this size. We're getting tired of singing that old "too much bloatware" tune, but it rings true too often, and the V5 is no exception. 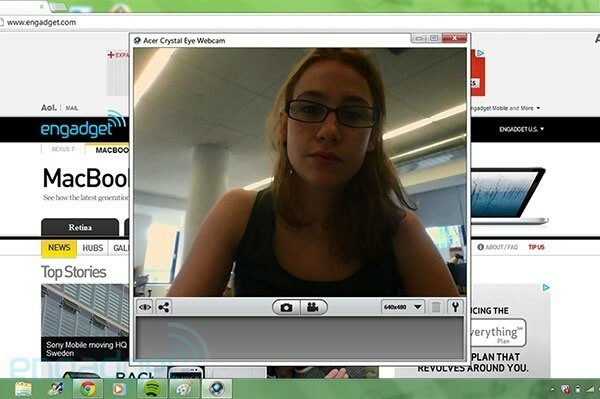 You'll find plenty of pre-loaded utilities, the most benign of which are Acer's branded programs, such as the Crystal Eye webcam software and Games. We find the pre-installed toolbars in Internet Explorer far more vexing: ads, a radio, shortcuts to two game services and a weather widget are activated by default -- and we took that tally after uninstalling the Bing Bar. Of course, there are McAfee pop-ups as well. The V5 comes with Acer's standard one-year limited warranty, which includes hardware support and 90 days of software support. This laptop will normally go for $550, but Acer is kicking things off with a $50 discount through Facebook. The already-available $600 Aspire V5 171-6616 is identically configured but isn't available with the $50-off promotion. But let's talk options. Look at other 11-inch laptops on the market, and you'll quickly see that the Aspire V5 stacks up quite well. While most machines pack AMD chipsets, Acer's model runs an Ivy Bridge CPU and offers 500GB of storage. But let us elaborate -- here's a look at some comparable machines. 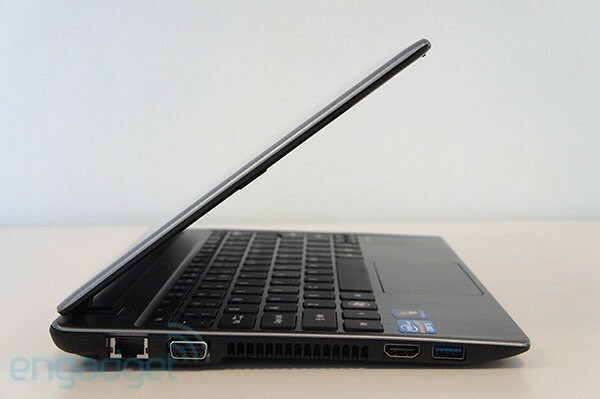 If you're in the market for an 11-inch notebook, the Aspire V5-171-6869 is a solid contender. Sony's 11-inch, $450 VAIO E is worth a gander, as it offers comparable specs in a new "wrap" design. (The best way to describe it is that the laptop looks like a briefcase when closed.) The processor is only a dual-core AMD E2-1800, but other specs match up with the V5's: a 500GB hard drive and a 1,366 x 768 screen, though 4GB versus 6GB of RAM. If you're open to an AMD chip, you might also consider the HP Pavilion dm1z, which for $505 offers a 500GB hard drive and 6GB of RAM. Though this machine was announced with a Core i3 CPU, only the AMD option remains available here in the US. And while the dm1z is a tad heavier than the Aspire V5 (3.2 versus 3.05 pounds), we like its patterned lid -- and the optional red color scheme. We recently singled out Samsung's Series 3 11-incher in our back-to-school roundup. For $450, you get a Core i3-380M processor in a sleek, 2.66-pound body with a sweet block-color design. Still, you only get 320GB of storage, and the CPU belongs to Intel's older Arrandale architecture. Since the 11-inch Aspire V5 has some internals in common with larger laptops, it's worth considering models with larger displays. The HP dv4, configured to match the V5 with a Core i5 CPU, 6GB of RAM and a 500GB hard drive, goes for $655, but the entry-level model with 4GB of RAM and a second-gen Core-i3 processor costs $530. Unlike the V5, this machine boasts an optical drive, but it does weigh a heftier 4.79 pounds. Finally, there's the Dell Inspiron 15R, which packs a Core i5 Ivy Bridge CPU, 6GB of RAM, 500GB and full versions of Adobe Photoshop Elements and Premiere Elements for $600. Again, you're looking at a heavier machine -- 6.05 pounds in this case -- but the extra screen real estate and larger six-cell battery may make it worth it for some.